David and I used to drink an Açaí Super Antioxidant from Jamba Juice every morning for breakfast (back when it was called the Açaí Super-Charger). Actually, we didn’t drink their exact smoothie, we had our own way of making it where we subbed blueberries for their sherbet and we subbed extra açaí juice for their soy milk… and the list goes on. You know that scene in When Harry Met Sally when they are at the diner and Sally (Meg Ryan) is ultra-neurotic when she’s ordering her apple pie? That’s me! I just like things the way I like them. On the side is very big for me. We were notorious at every Jamba Juice in the area and you could walk into our regular location and order an “açaí David’s way” and they knew what we were talking about. We were so regular that the manager told us to just call in the morning and they would have our smoothies ready to go. David would call as we were leaving for work whoever picked up the phone would simply say, “Good morning David. How many today?” (imagine their surprise the morning we said 8… let’s just say we introduced a lot of people to the Açaí Super-Antioxidant). We had a friend that worked at Jamba and he said that we actually came up at the regional meeting one time (not at all embarrassing). Anyway, one day when we were having our smoothies, the manager asked us if we had ever had a matcha shot. We had never even heard of matcha so our interest was piqued. We watched as he took a small spoonful of a bright green powder and poured it in a martini shaker along with some soy milk and ice. One sip and we were hooked. As you can imagine, our mornings became much more expensive. As the economy worsened and our kids started wanting their own smoothies (and matchas), it became less convenient (and cost-effective) to hit up Jamba Juice every morning. We started making our smoothies at home. It really wasn’t hard to figure out how to make something similar to the açaí drink that they were making. We made a few tweaks here and there and ended up coming up with a drink that we liked even better than the Jamba version. Matcha, though, was something that we just couldn’t replicate, or even come close for that matter. I was determined to solve the mystery, and when I become determined to solve something, it gets solved. Anyway, after several months of failed attempts and more matcha powder than I care to mention, I was starting to become discouraged. I learned a lot about tea ceremonies and how the Samurai used to drink matcha before battle. I tried several techniques for preparing the tea, but I didn’t like anything as well as what I was getting from Jamba. Finally I made a breakthrough. I had been trying to replicate Jamba Juice’s matcha, which uses soy milk. I seriously think I tried every kind of soy milk available in Southern California, but none of them tasted right. I keep Almond milk at our house because I like it on my cereal and one day it just hit me that I should try it. It was perfect. No, it doesn’t taste exactly like Jamba Juice but I loved it just as much. Now I have one every day (and sometimes multiple times). It really is the perfect afternoon pick-me-up. Since discovering our matcha shot recipe, I have also experimented putting matcha in smoothies, lattes and even egg nog (I’ve liked all of them). I’m looking forward to trying it in baked goods. Makes 2 matcha shots, unless you’re me. Then it makes just one. 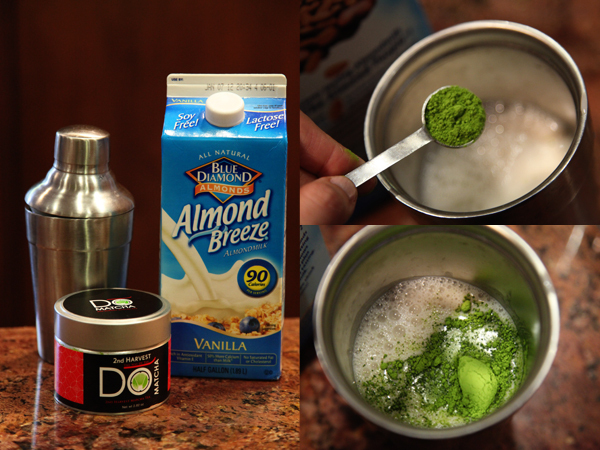 Place the almond milk and the matcha powder in a martini shakes with the ice. Shake for about 30 seconds and strain into glasses. Do you happen to know the difference between Raw Maca Powder and the one you are using? I think I bought the wrong powder. I would like to get it to taste like the Jamaba Juice shots. 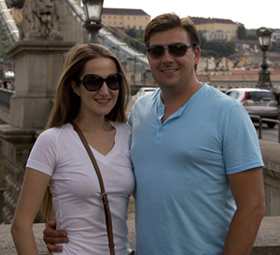 Thank you again for the post. Sorry for not replying sooner. You want to get Matcha Green Tea Powder (ground tea leaves). Raw Maca Powder has many health benefits, but it is made from Maca Root, so it would be quite different from what you get at Jamba Juice. At Jamba Juice they make their matcha shots with their house soy milk (or orange juice). After experimenting with various milks we have found that we like it in almond milk, but you just have to experiment with different milks until you find the taste you prefer. 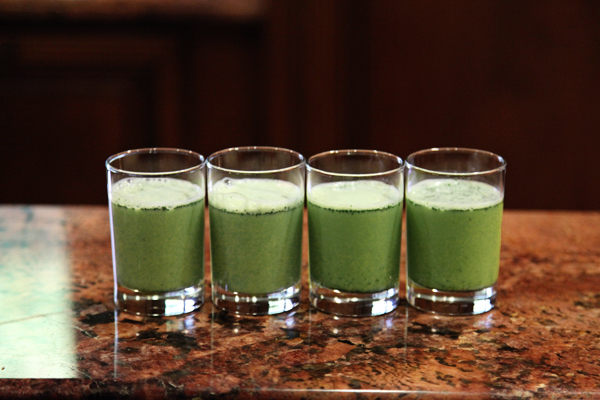 We have found that the ratio of 1 tsp matcha powder per 1 cup of milk yields the best results.